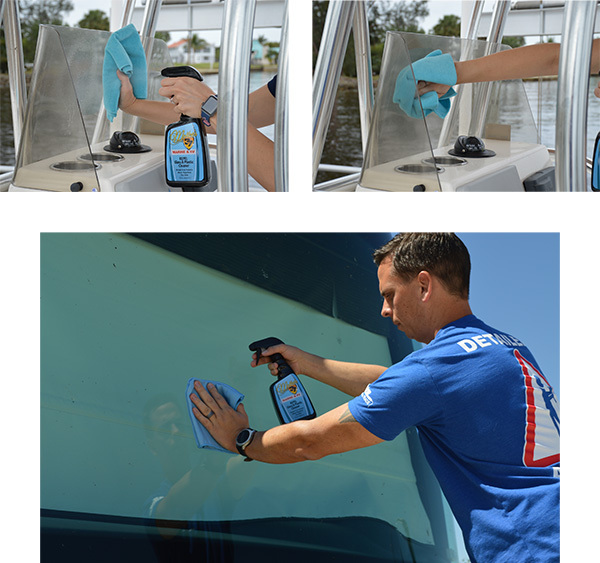 McKee’s 37 Marine & RV Repel Glass & Plastic Cleaner takes any guesswork out of cleaning your glass and plastic surfaces. Simply spray the cleaner directly onto the surface and wipe clean using a high-quality, lint-free microfiber towel. Use a second clean, dry microfiber to buff off any excess. You’ll never struggle with streaks again! Spray cleaner directly onto surface. Wipe clean using a high quality, lint-free microfiber towel. Use a second clean, dry microfiber towel to buff off any excess. Repeat if the glass or plastic is heavily soiled.